This simple and stylish contemporary ottoman will complement your living room ensemble nicely. 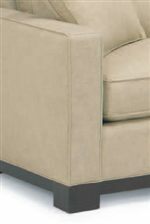 The plush rectangular top cushion offers the perfect spot to rest your feet. Welt cord trim creates a tailored look, while a wooden base rail and block feet add a touch of sophistication. The 0555 Contemporary Rectangular Ottoman with Wood Base Rail by McCreary Modern at AHFA in the area. Product availability may vary. Contact us for the most current availability on this product. The 0555 collection is a great option if you are looking for furniture in the area.